Here we will show you how to wire a foot switch but first of all lets help with getting into it. These foot switches have are a snap together construction so sometimes a bit awkward to open for the first time. Have a look at the back of the foot switch and you will see 2 slots and the words ‘Open’. 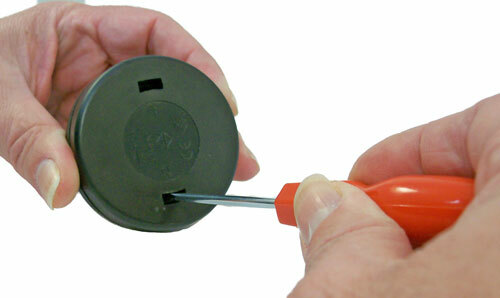 With a screwdriver around 3mm wide insert it into the slot with the blade closest to the centre. Then twist a little whilst pulling the 2 parts apart. Do the same in the other slot. Now inside the foot switch there is a switch in the middle which you will connect the Live or Brown wire to and 2 additional terminals for the Neutral connection and the Earth connection. Also you will see 2 cord grips which must be used to hold the flex firmly in the foot switch. Connect the wires as show here. Remember to add the spring onto the switch and then line up the top cover and push together so it snaps shut. Download the instruction leaflet here. The switch in this foot switch has a 1 amp rated switch which means you can use this with a 240w lamp but in most cases a 100w lamp would be the normal. 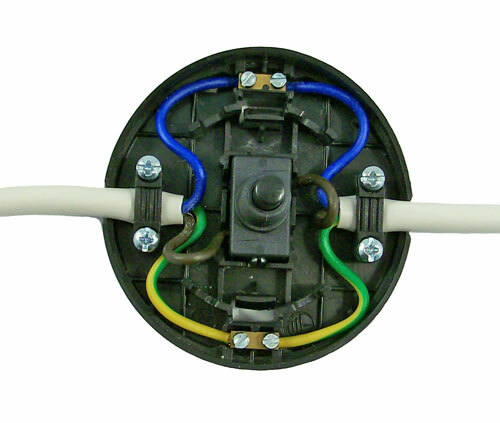 If you only have a 2 core flex then the Green & Yellow wire in the above photo would not be used.